So, you’ve never heard of this weird thing called “vonu.” That’s okay–Kyle and I didn’t know about it either until March of 2016. That, and this freedom strategy is hard to come across. You found your Rothbard, Mises, and Konkin easily, but you would have had to scour the deepest, and BEST parts of the Internet to find anything about vonu. We’ve already done that work for you. The idea of this page is to provide you with a road map of sorts; if you only have 5 minutes, that information will follow this introduction immediately. If you have hours to learn, what you’re looking for will be below that; if you have ample time and are deeply interested in what we have to offer, continue down this page. You’ll love it…we promise or your money back. A: Vonu is the condition or quality of, as well as the action of achieving, an invulnerability to coercion. Etymologically, it is an awkward contraction of the phrase, VOluntary Not vUlnerable (hence, “vonu”). The idea is to become as invulnerable to coercion as HUMANELY possible, from both public coercers (the State) and private coercers (ACTUAL criminals). “Freedom” and “security” mean different things to different people. All human language is fluid–the meanings of words change over time (even if only slightly). Hence, why Rayo and other vonuans literally came up with their own language and terms to explain what they were talking about. A semi-comprehensive list can be found here. 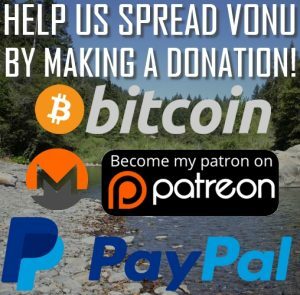 It includes the various grammatical variations of the word “vonu”, as well as various terms that are used frequently in vonu publications and the podcast. That’s a fun question to answer, and I’ll do so briefly here. Rayo (aka, Tom Marshall, Tom of Preform, El Rayo) was a part of the bustling southern California libertarian community in the 1960s. 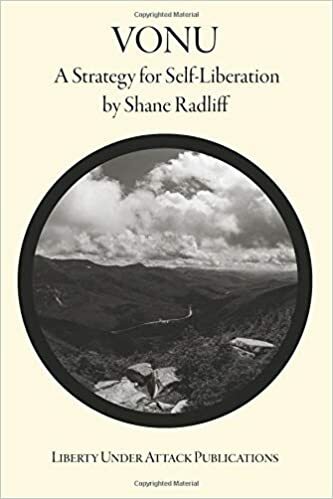 He participated in Nathaniel Branden’s NBI, an Objectivist school, as well as the Free Isles Project, whose goal was to found a new libertarian nation on an island somewhere. After no progress whatsoever, Rayo got sick of all the “talkers” (armchair philosophers) and lack of “doers” and decided to move out of his apartment into a camper mounted on his pickup truck. He pursued van nomadism for some time, until he realized that it didn’t create the freedom he desired. So, he and his freemate, Roberta, decided to pursue wilderness vonu–they pitched a tent, literally, in the Siskiyou Region (northern California/southern Oregon) for most of the year and only returned to the statist-servile society when they needed to re-up on supplies, or to meet up with readers or Vonu Week participants. They also spent some time in the Bella Coola region of British Columbia. They contributed to/published many libertarian publications, such as: Libertarian Connection, Vonu Life, Preform-Inform, Going Mobile, Innovator, and many more for some time, until Rayo’s infamous disappearance in the year of 1974. No one has heard from him since, but the prospects for vonu live on. So, you’ve got a superficial understanding–fantastic. You’re privy to information that the majority of folks in the statist-servile society have never heard of or even considered. You can find a whole slew of FAQ’s here, and if you have any others, feel free to contact us (PGP keys available)–we’re always happy to answer any questions our listeners/readers may have. If you’ve made it this far, I recommend you subscribe to The Vonu Podcast and catch up, if you haven’t done so already. Kyle and I dive extremely deep into this subject, and without listening to the show, you are missing out on valuable information. Secondly, we’ve accumulated and digitized a number of vonu publications, straight from the sources (the ones without links are awaiting publication). At this point, you have already consumed all of the material available, and we salute you (in the non-statist way). Season 3 will kick off at the end of January 2018, wherein Kyle & I will develop these strategies beyond what Rayo could have (likely) ever envisioned. Do you have experience with the strategies Rayo presented, whether in the present day or previously? Do you have ideas for making any of these strategies more practical in 21st century, police state America (or elsewhere)? 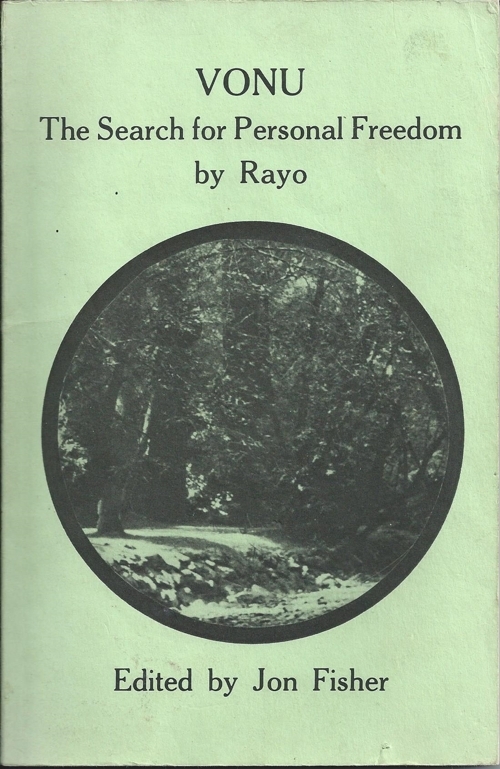 Rayo edited a slew of publications and consistently received feedback from his readers. We want something similar here. This isn’t about Kyle or I–this is about a potential vonu association in the future. This is only a tentative road map and will be updated in the future.